Finally arrived … After a while of waiting and some indiscretion, finally comes the new MiniX Neo U9-h. Presented at IFA Berlin 2016, with its features and with the renowned Software stability, promises to them in 2017 the market reference for TV boxes Android. The Minix Neo U9-H is the latest addition to the company in Hong Kong that updates its offer TV boxes, integrating a processor Amlogic S912. An octa-core 2.0 GHz maximum clock by bigLITTLE, architecture and Mali-820 MP3. As has already been said on more articles, no doubt, AmLogic in the last period, look for the excellent compatibility, performance, was among the producers of SoCs for TV boxes/Android mini PC one of the most appreciated by users. In fact, lately we had often to analyze TV boxes based on the Chipset of the famous Asian. Amlogic S912 that promises to be for the time being the true market reference. In fact, we remind users the success and longevity of Smart (also used with the previous flagship product of MiniX House: the Neo X 8-H), first 4 k decoding chipset to offer also in h. 265 and HDR, excellent speed and very high compatibility. The distinction, as mentioned, this new Tv Box based on AmLogic S912, running Android optimized video 6.0, Marshmallow is to display 4 k with support for H. 265 and HDR. HDR allows the ability to view content without problems in High Dynamic Range without the need for owning a tv HDR-ready. We saw with our own eyes the difference images reproduced without HDR and HDR; Needless to say that the image quality increases exponentially, giving a much deeper color range. For those who want to learn more about HDR (High dynamic range) we suggest reading the following article on Wikipedia: High dynamic range imaging. MINIX has accustomed us to great TV boxes, capable of providing truly high performance and excellent stability. Performance and stability optimization job offers from Software that allow you to make the most of your Hardware for their own platforms. The new AmLogic S912, as mentioned several times, is a CPU of the highest profile with features that really matter, also introduces a number of new features all linked to Video decoding and image quality. These updates "architecture" (Octa-Core CPU) do make a real leap forward in performance and put it at the top movie playback quality (4 k, h. 265, HEV/C and HDR). Then in the background, an excellent box, among other things based on the new Android OS 6.0 Marshmallow. 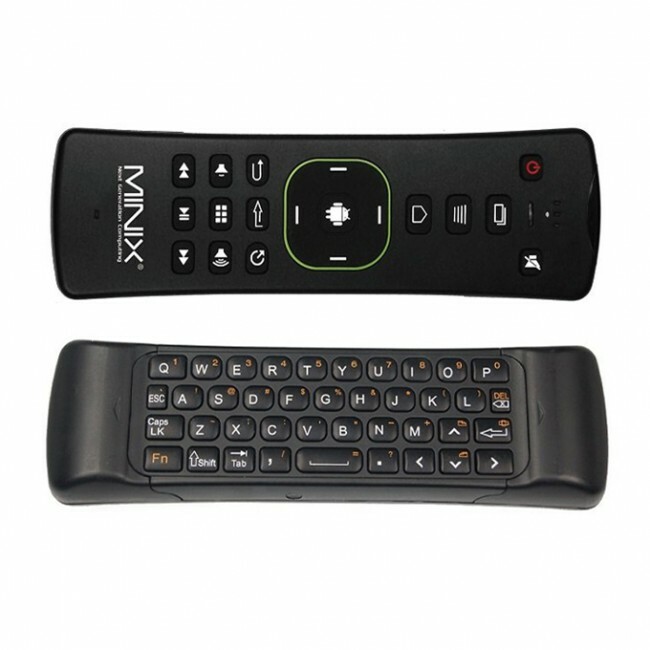 The controller MiniX Neo A2 is a dual side controllers (double sided). What has always amazed of this Keyboard is the compactness, solidity and precision. Suitable for use mixed Media Box/Mini PC is great for easily search the web, write email, surfing the menu, chat, use social networks etc. Airmouse mode, really accurate and well functioning. Compatible with all operating systems (Windows, Mac OS X, Android and Linux). What can we say, aesthetically, it completely changes the experience of using a Tv Box as the Neo U9-H, is really a great product … from 5 stars. The current version of XBMC MiniX Edition is 16.3, perfectly in line with current developments of Kodi. Ultimately one of the best TV boxes (for instance features greater than or equal to the best box on the market). With its classic shape, MiniX is suitable to your living room and comes up with seriousness and sobriety. In detail, we have good blocking CPU-GPU-RAM. The qualities of the new CPU AmLogic S912 are undisputed and for us a guarantee, either for playing movies (also in 4 k, H265/HEV-C and with the novelty of HDR), both for use in other areas (apps, games etc). The Internal Memory is 16 GB eMMC (store) and the Networking industry is of a high standard with RJ45 Gigabit Ethernet and 802.11 Wi-Fi Dual-Band (2.4/5 GHz dual-band MIMO) ac with external antenna. Outdoor antenna that maybe you might not like aesthetically, but whose presence assures us better Wi-Fi reception. As regards KODI, the well-established partnership with the XBMC Foundation (Group business development officer of KODI) ensures compatibility and new features (exclusively) for users of Box MiniX. In addition, MiniX technicians they confirmed that the U9-H will get support for Android 7, this ensures support and updates for at least the next 2/3 years. The final considerations, can only be positive, there are good prospects to repeat the exploits of MiniX Neo X 8-H, we have already seen some box AmLogic S912-based, but the level of optimization of MiniX, makes this box (at least in the introduction) greater than those seen so far. Unique "Neo" this TV boxes, may be the lack of a USB 3.0, which could limit the transfers to/from an external drive. The box is not yet available, but it lacks very little … should be on the market in a few days at a price of around 160 Euros, but from this point of view are waiting for confirmations. We conclude the article anticipating that this box there will be provided (when ready) to be able to carry out a full review, assessing the stability and the real performance of box, even under stress. Articolo successivo Arrivano i giorni del Black Friday, Tante Offerte dai Big … Le tecniche per non perdersi nessun offerta !! Articolo precedente Here come the campaigns of end year … Many offers and coupons to prepare for Christmas!